How does our production process work? Introducing the newest and most impressive addition to the Tru-Fit series: the 20' Tru-Fit MEGA MAX Media Kit. This magnificent 20' multi-media kit brings together several of our top selling displays to form a unique package designed for maximum branding and media power, allowing you to market your product on a whole new level at trade shows. 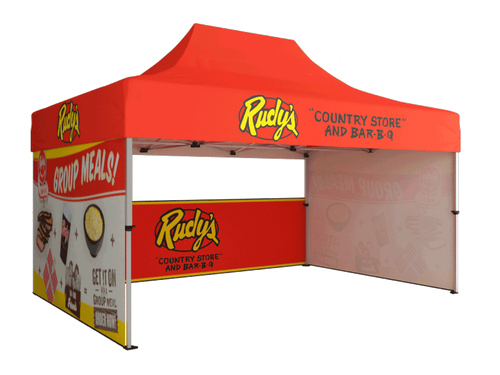 The 20' Tru-Fit MEGA MAX trade show display features a seamless 20' fabric dye sub backdrop and two Tru-Fit MAX add-ons. Each MAX add-on contains a waterfall TV stand with two aluminum shelves and a TV mounting bracket, a custom printed header. The shelving unit is ideal for product displays or keyboard and mouse placement, so your prospective clients can have an interactive experience during the trade show. The Tru-Fit MEGA MAX also has maximum portability! Two hard cases can house the entire display, frame, graphics and all, allowing you to move easily to and from each trade show or event. The podium conversion kits allows you to convert the hard cases into a professional-looking podium stands, ideal for displaying handouts or other marketing materials during trade shows. Let us design for you! Standard Design Services are offered at set rates based on 6 hours for backdrop + podium design (single sided backdrop). Simply send us all of the design elements such as your logos, text, pictures, and anything else you would like included, and our team of experienced designers will create a custom, professional, and effective design for you! Please note: Double-Sided print designs will require additional design services IF the back side design is different from the front side. Additional design time will be assessed on a per project basis. For more information on our design services, CLICK HERE. Copyright 2018 Display Overstock. All rights reserved.